The most deliciously fragrant orchids of summer are without question the stanhopeas. June marks the beginning of Stanhopea season in the Fuqua Orchid Center. A Stanhopea in flower is an unforgettable experience. 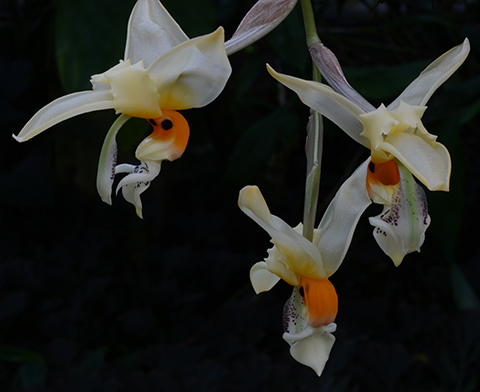 I remember years ago having to crawl under a greenhouse bench to get my first look at a pendant Stanhopea spike and to inhale its confectionery fragrance. Each flower looked like a bird in flight. And the fragrance was good enough to eat. To my nose Stanhopea embreei smells like vanilla creme icing, even though my brain, which left Organic Chemistry by the roadside years ago, knows that the floral compounds common in Stanhopea include methyl cinnamate, benzlaldehyde, and cinneol. Why the intense fragrance? Who is the intended recipient? Not us, of course. It's all about the pollinator: male Euglossine bees, who collect the fragrance, not for food, but to attract female bees. Sad, but Stanhopea flowers only last about three days. It's as though the plant can't sustain the massive effort required to produce such an extraordinary creation. The good news is that a mature plant often produces several spikes each season. Come and enjoy the fragrance!